All other services are referred to Oradell Animal Hospital, 580 Winters Ave., Paramus, New Jersey. Patients seen at Oradell Animal Hospital can be seen at the Hasbrouck Heights Office for follow-up care. Mary Peluso came to Oradell Animal Hospital as manager of the Hasbrouck Heights office after working 13 years at Cresskill Animal Hospital. Her responsibilities include overseeing client services, purchasing, and staffing and ensuring exceptional customer service. Mary resides in Waldwick with her husband, two children, two dogs, Rebel and Bravo and her six cats. Mary loves vacationing with her family at the beach. Dr. DeVries graduated from The University of Illinois, completed an internship at the Animal Medical Center in New York, and is board certified by the American Board of Veterinary Practicitioners. As Assistant Director of Oradell Animal Hospital, Dr. DeVries sees clients at both Oradell Animal Hospital and our Hasbrouck Heights office. His interests include practicing medicine and surgery and in his spare time he enjoys choral singing, traveling and spending time with his wife Susi, their children, and their grandchildren. Dr. DeVries and Susi share their home with their Australian Shepherd, Molly and their three cats Indi, Charlotte, and Lily. Dr. Boren graduated from the University Of Florida School Of Veterinary Medicine and has remained on the staff of Oradell Animal Hospital since completing an internship here in small animal medicine and surgery. Dr. Boren has a special interest in exotic and zoo animal medicine. He is the veterinarian for the Bergen County Zoo and is consultant for The James A. McFaul Environmental Center in Wyckoff, New Jersey. Dr. Boren sees appointments at Oradell Animal Hospital in Paramus and at our Hasbrouck Heights, New Jersey office. Dr. DeSanto graduated from The Ohio State University School of Veterinary Medicine and completed an internship in small animal medicine and surgery at Oradell Animal Hospital. He then joined the staff upon completion of his internship. Dr. DeSanto enjoys internal medicine and veterinary dentistry. He is one of the founding veterinarians of Bergen County’s Animal Emergency Preparedness Program. Dr. DeSanto likes to play softball and enjoys woodworking. He sees appointments at Oradell Animal Hospital, Paramus and in our Hasbrouck Heights, New Jersey office. Dr. Karlecke graduated from Iowa State University College of Veterinary Medicine. 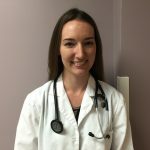 She joined the staff of Oradell Animal Hospital with a special interest in emergency and critical care medicine but enjoys all aspects of veterinary care medicine. Dr. Karlecke enjoys hiking (with her dogs), reading, photography, and actively working with her registered pet therapy dog. She enjoys spending time with her husband and their three dogs and four cats. Dr. Troyer graduated from the Ohio State University College of Veterinary Medicine after which she completed a one-year internship at the Animal Medical Center in NY, NY. She joined the staff at Oradell Animal Hospital in 2005 as a member of the general medicine and surgery group, but also has a strong interest in pain management and palliative care. In 2009, Dr. Troyer helped to create the Oradell CARES program. Oradell CARES is designed to assist families and patients with hospice and care giver support issues through both in-home evaluation and out-patient management. In addition, Dr. Troyer became certified in veterinary acupuncture by the Chi Institute of Chinese Medicine in Reddick, Florida. She uses integrative medicine especially in cases where quality of life issues are paramount, and practices both out-patient and in-home pain management using both eastern and western techniques. Dr. Troyer has a special interest in international studies and travel, particularly in Central America and Africa. In her spare time, she enjoys her children, yoga, running, and cooking.